Slipstream appearing in Transformers Cyberverse? Discussion in 'Transformers News and Rumors' started by megatronski, Apr 9, 2018. And they haven't done so? Animated or Prime? The WFC games? There's also Rescue Bots and the first live action movie. Hell, I'm not even counting anything prior to this decade. And people haven't seen enough of Prime, Bee, Megs, etc? It's not like they've appeared in every single piece of Transformers media in the past 10 years or anything. We haven't heard anything regarding anyone in this show. There's no way you can confidently say this. Says the guy using curse words to refer to me? If you want to talk about inconsistent iterations I should point out that the G1 Sunbow show didn't exactly follow what came before in the original Toy bios and Marvel comics so if you want to bash the non G1 shows for not following what came before you might as well add the Sunbow show to that mix because that did it first. I’m caught up with IDW Phase 2, and that Starscream certainly rivals and perhaps even beats Armada ‘Scream for me. And, who knows, he might even go all the way into the hero mode that Windchan plucked from his spark and we’ll get Star Scry, who forever fights people about enunciating it as Stars’ Cry. But, I’m sorely disappointed that Slipstream didn’t find a spot in IDW Phase 2 at some point, because few characters are born fully formed and they take multiple passes to get somewhere interesting. So, if you’re mad that something that might last a couple years at most has things slightly remixed, I found something relaxing to listen to. Shoot, you got my hopes up. I thought you were talking about Flamewar appearing in Cyberverse. Wow, so now any deviations from G1 in TF media are going to shatter the entire franchise? Just how fragile is its foundation then if it requires maintaining every minute detail from the original crappily animated and lazily written cartoon that wasn't consistent with what came before it or even with itself? I kinda wish they’d do another AEC where most of the assumptions were tossed out the door (ok so the movies kinda do that) It’s nice that Animated, Aligned, and Cyberverse strayed a bit from G1 here and there (Animated Prowl, Prime Arcee, RID15 Grimlock) but at what point does something become so G1 that it’s just... another version of G1? Like the difference between the toys, Marvel, Dreamwave, IDW, etc? With Generations firmly in place now, they can afford to do something wild and different with the kids line instead of “G1 but with some changes”. 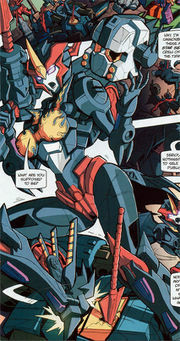 Windblade is basically considered g1. Well at least hasbro thinks.